New Rochelle, NY, November 23, 2015-Meperidine, an opioid analgesic commonly used to control shivering in accidental or therapeutic hypothermia, has been linked to increased seizure risk, but a new study finds little published evidence to support this risk. While use of meperidine for pain relief has declined, its role as an effective anti-shivering agent should continue to be explored, conclude the authors of the study "Seizures and Meperidine: Overstated and Underutilized," published in Therapeutic Hypothermia and Temperature Management, a peer-reviewed journal from Mary Ann Liebert, Inc., publishers. 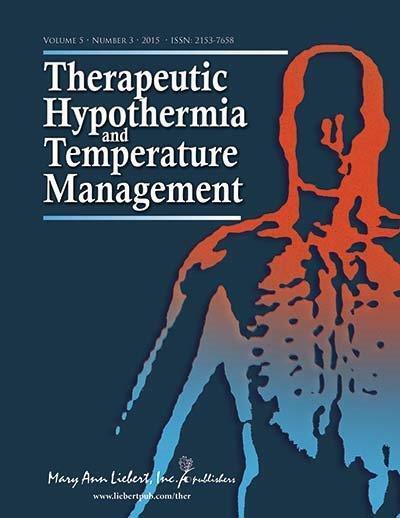 The article is available to download for free on the Therapeutic Hypothermia and Temperature Management website until December 23, 2015. Konrad Schlick, MD and Patrick Lyden, MD, Cedars-Sinai Medical Center, Los Angeles, CA, and Thomas Hemmen, MD, PhD, University of California San Diego, reviewed 45 years of medical literature and found relatively few cases of meperidine-associated seizures. In many of the cases, coexisting illnesses, conditions, or other factors could have contributed to or explained the increased risk of seizures. "This literature review that reports limited evidence to indicate that the anti-shivering agent meperidine increases seizure activity should be very important to the field of Therapeutic Hypothermia and Temperature Management," says W. Dalton Dietrich, PhD, Editor-in-Chief and Kinetic Concepts Distinguished Chair in Neurosurgery, Professor of Neurological Surgery, Neurology and Cell Biology, University of Miami Leonard M. Miller School of Medicine. Therapeutic Hypothermia and Temperature Management provides a multidisciplinary forum covering all aspects of hypothermia and temperature considerations relevant to this exciting field, including its application in cardiac arrest, spinal cord and traumatic brain injury, stroke, and burns. Novel findings from translational preclinical investigations as well as clinical studies and trials are featured in peer-reviewed articles, state-of-the-art review articles, provocative roundtable discussions, clinical protocols, and best practices. Tables of content and a sample issue may be viewed on the Therapeutic Hypothermia and Temperature Management website. Mary Ann Liebert, Inc., publishers is a privately held, fully integrated media company known for establishing authoritative peer-reviewed journals in many promising areas of science and biomedical research, including Journal of Neurotrauma and Brain Connectivity. Its biotechnology trade magazine, Genetic Engineering & Biotechnology News (GEN), was the first in its field and is today the industry's most widely read publication worldwide. A complete list of the firm's 80 journals, books, and newsmagazines is available on the Mary Ann Liebert, Inc., publishers website.